I love bread. Okay really just any carb, I love. Which can be bad, depending on how much I eat. 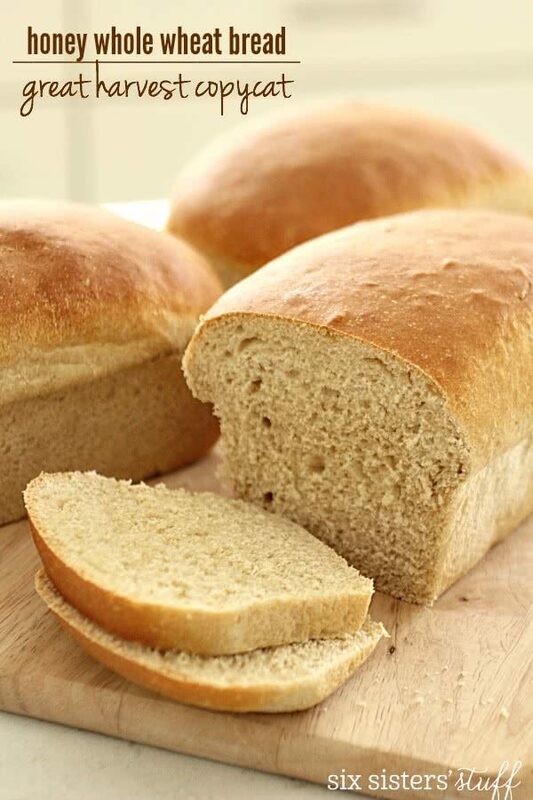 However, this Great Harvest Honey Whole Wheat Bread, is so easy to make, and extremely filling. I can only have one slice, then I am stuffed. This is a healthy recipe, you will love. One of my weaknesses in life is bread. I just seriously love carbs, and is there any better smell in the world than freshly made bread? I used to be scared of making bread, but I have learned that practice makes perfect and I can whip out a couple of loaves in no time at all. I love that this recipe is not only delicious, but also healthy. When I first started making whole wheat bread, it was hard for my kids to get used to, so I did half whole wheat flour and half white flour then slowly added more wheat flour each time I made it. They now prefer wheat bread to white bread, so I am counting it as a mom win. I use a Bosch mixer to make my bread, but I have made it a couple of time without a mixer (just mixing by hand) and it still turned out delicious (plus you burn some serious calories doing it by hand). 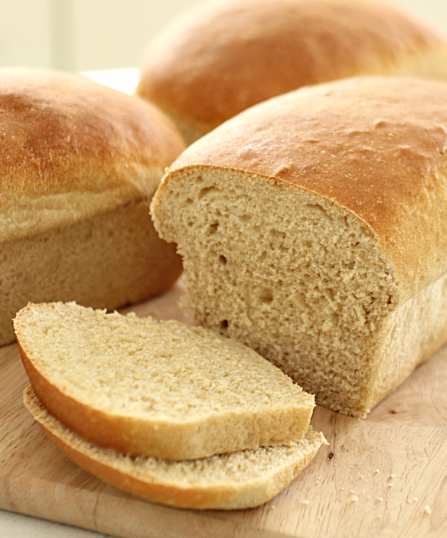 Because I am such a carb and bread lover, there are so many variations and things to make with this bread. –Overnight French Toast Creme Brûlée Bake: This is the best French Toast you will ever taste. It is crunchy and soft, and full of sweet flavor. You will love it, especially with this bread. –Cheesy Garlic Texas Toast: This is a perfect side for spaghetti, or any Italian dish. I love dipping my bread in my marinara sauce. –Waldorf Turkey Sandwich: This sandwich is out of this world. Pair it with this bread and your life will be changed. –BLT Grilled Cheese: Okay this recipe might win. It’s comfort food and deliciousness all in one. You will love how simple, easy, and delicious this sandwich is. how long does this bread last, after being made? This bread lasts about a week or two out on your counter or in your fridge, when kept in an airtight container, or ziplock bag. We usually freeze the bread until we need it, then thaw it when necessary. In a large bowl, add water, yeast, honey and salt. Let it rest for 5 minutes (or until the yeast foams). Add in flour 1 cup at a time, kneading it between each cup of flour added if you are making it by hand. If you are making it with a mixer (like a Bosch or Kitchen Aid), use a paddle attachment and just let it mix while you add the flour. Knead bread for about 5 minutes. If the dough is sticky, add only enough flour so that the dough barely pulls away from the bowl. Every time I make bread, the amount of flour I use varies - humidity and elevation will make a big difference too. I usually use between 10-11 cups. Preheat oven to 170 degrees; turn the oven off, and let dough rise inside the oven for 15 minutes. Carefully remove bowl from oven. Spray the back of your hand with cooking spray and punch down the dough. Form into a log and cut in half, forming two larger-sized loaves. Put into 2 greased loaf pans. Again, preheat oven (if it?s not warm anymore) to 170 degrees and let the dough in the pans rise in the oven for 20-30 minutes, or until the dough doubles in size. Remove dough from oven and set oven temperature to 350 degrees. Once oven is pre-heated, place the loaves back in the oven and bake for 30 minutes. Remove from pans immediately and let cool completely on a cooling rack. *You don't want the water to be TOO hot, or it will kill the yeast. I would say that it's maybe around 110 degrees. My rule of thumb is as warm as you can stand to wash your face in. After the loaf has doubled in size, in the 20-30 min, do you remove from the oven, heat it to 350 and then return to the oven to bake or leave it in while the oven heats to 350? I took it out. My daughter got started on a batch a couple of weeks ago forgetting she had conflicts and it survived an extra punch-down and refrigeration before the final rise, so it's pretty tough. Hi Kimberly! So sorry about that- yes, take it out. :) Let the oven preheat, and then return it to the oven. I am so sorry that I didn't clarify! I re-wrote the instructions so that there is no confusion. :) Thanks so much! I'm working on this bread at high altitude (6000 ft) and my first effort wound up a little flat on top. Can you specify the bread pan size you're using? I'm in 9x5 pans, but these loaves are huge, and I'm afraid the combination of low air pressure and no support as it rises contributed to the flat tops. My typical altitude adjustment involves adding gluten (and not using fast yeast, which seemed to be no problem here). But gluten dulls the taste, and I don't want to touch the wonderful flavor of this bread if I can avoid it! Hi Margo. We used the standard 9 x 5 inch loaf pan. We are at about 5000 feet and didn't have a problem. Let us know how it all turns out. Thanks for stopping by our blog and have a great week. Hi. I was just wondering if you can cut this recipe in half? It seems like anytime I have tried to cut a bread recipe in half in past cases, it never turns out. What about with this bread? You should be fine cutting this recipe in half to get one loaf. I love making homemade bread. Does it have to be FAST active dry yeast? I just have active dry... also can I use the yeast packets? If so would it just be like 2 packets? I too am wondering if this recipe should yield 3 or 4 loaves instead of just two ... I tried following the recipe to a 't' and after rising in the oven just 10 min, the dough of each loaf was already so huge, they were drooping over the sides of my 9x5 pans. The ingredient list feels like it should yield at least 4 as well, so I'm just a bit confused what I could be doing wrong here! Hi Kristi! To be honest, every time I have made this bread I have only gotten two loaves . . . I am not sure if it has anything to do with my altitude? I only know the very basics when it comes to bread, so I am not sure why yours didn't turn out. I am so sorry!! Thanks for stopping by! When you put the bread into the oven for the second rising do you turn the oven off like you did the first time or do you leave the oven temp at 107 degrees while the bread is rising? Can you use this recipe in the bread machine? I make a recipe similar to this one, but for the flour I use 7-8 cups whole wheat flour OR 10-11 cups freshly ground flour. I wonder if that'll work out better for some people. And I make 2 large loafs plus 1 medium loaf with this. Can you substitute instant yeast 1:1 for the active dry yeast here? Has anybody made this with a KitchenAid stand mixer? My user manual says not to use recipes that call for moth than 8 cups of whole wheat flour so I am hesitant, but I really want to try this. What size bread pans are you using? 9 x 5 inch or 8 1/2 x 4 1/2 inch bread pans will work great. In step 6 do you turn the oven off again while the loaves rise? Or leave it at 170 degrees? Turn it back off after it heats up. How long does the bread last after being made? Can you freeze to serve at another time? You can make the bread and then freeze it and use as needed. We always freeze it and pull a loaf out one at a time. Freeze in a freezer bag for freshness. This bread recipe is missing a key ingredient - there is no oil or fat and it turns out like a dense brick of condensed wheat. Would recommend not making it or the author reviewing the recipe for missing ingredients. It is designed to use no oil, for those of us who don't use oil at all in any foods cooked or eaten. It should be fine. Great Harvest uses fresh, block formed yeast. They make a loose dough called a poolish using the honey, water, yeast (not salt, at this point) and about a third of the asked for flour. Mix this by hand until incorporated, cover and let sit for about 20 minutes in a draft free and moderately warm space. After that, add the rest of the flour, a cup at a time, and salt and mix. Proofing the dough in the oven is something I have never tried but it could work. The bakery I worked at left the dough in the mixing bowl, covered, for about 40 minutes or until double in size. Then punch it down, turn it out onto a lightly floured surface and shape into loaves. Loaves were allowed to rise in a draft free place for another 30 minutes or so. Bake, cool and eat.